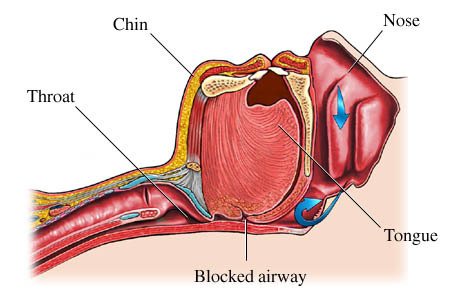 Sleep Apnea is the cessation of breathing (while asleep) for a certain period of time (at least 10 seconds). It is a condition that is often associated with, but not limited to individuals who are overweight. An increase in weight in the neck and trunk heighten your risk of developing sleep apnea. Overweight individuals tend to have a greater amount of fat deposited along the outer walls of their airways: This translates into an increase in pressure on the airways which can easily cause them to collapse. This in turn results in a narrowing of the airway, which is the basis of what an obstruction is all about. In overweight individuals the tonsils and tongue are larger and full of fat…At night when you are lying down (especially on your back , also known as the ‘supine’ position), the enlarged tonsils and tongue fall backwards into the throat further adding to the obstruction caused by the excess fat along the walls of the airway ( see physiology section above ). Generally speaking, heavy individuals with the following neck circumferences are more prone to Sleep Apnea: Men – 17″ or greater and women – 16″ or greater. Again, the reason for this is that there is a greater amount of fat deposited along the walls of these individual’s airways. I’m sure that you can think of many situations in life that can result in one being caught up in a vicious cycle. Obesity and Sleep Apnea are examples of this I.e., An increase in body weight will make you more prone to Sleep Disordered Breathing (S.D.B). Sleep Apnea is also associated with excessive daytime sleepiness (E.D.S) and those who suffer from E.D.S will most likely not feel up to exercising to help lose weight; this further propels the problem. So if they treat the Sleep Apnea, patients may feel better and more motivated to exercise. A ten percent reduction in your weight can significantly decrease the severity of your Sleep Apnea, I.e., make an improvement from moderate to mild. In the next blog we will look at how Sleep Apnea can affect a certain protein/hormone called Leptin. This in turn can have an effect on your weight.